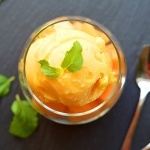 This recipe for Vegan Cantaloupe Ice Cream is another one of those recipes born from me going to the grocery store, seeing that cantaloupe was in season and on sale, and having absolutely zero plans for what I would do with it when I got it home. After a little research, I came across a recipe in a 1989 New York Times Cooking archive by Giuliano Hazan and wondered…could this work with coconut milk? Challenge accepted! The recipe is made up of just four ingredients: Cantaloupe (of course), sugar, water and canned coconut milk (do not use light). The cantaloupe flavor definitely shines through with a bit of sweetness from the sugar that’s definitely not overpowering and an undertone of coconut. I think you’ll really love it! I first cut the ripe melon into 1″ chunks and add the water at this point. This just makes it easier for the blender to process them. I would suggest a high speed blender such as a Vitamix or a Blendtec. I’ve only had my Vitamix for a little over two years now and I can’t imagine going back. It’s an investment for sure, but I am happy I saved up for it. You can certainly use a food processor or other blender to make this puree, but you will have to work in small batches to get it this smooth. The most important tip I can give you on this particular recipe is to make sure everything is REALLY cold. 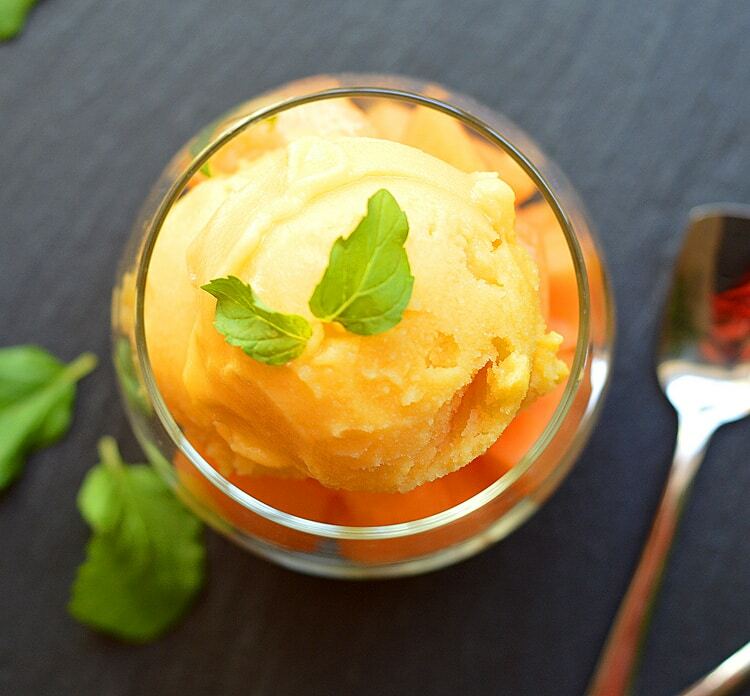 Don’t worry, you can make this Vegan Cantaloupe Ice Cream without an ice cream maker (although it is lighter and more “ice cream” like in texture if you do). Look how creamy and yummy that is! In his original recipe, Chef Hazan whipped the cold heavy cream in a mixer until it is about the density of sour cream. Since I chose to use canned coconut milk, I added the sugar to the mixer at this point as well. It helps it whip up. This is virtually the coconut whipped cream I made here but using granulated sugar instead of powdered and minus the vanilla. You’ll then fold the coconut cream mixture with the pureed melon mixture and add to an ice cream maker whose bowl has been frozen overnight. After about 30 minutes or so, you’ll get a nice soft serve (my preference). For a scoopable ice cream, place into a glass loaf pan and cover with aluminum foil. Freeze overnight. When you are ready to serve, allow about 15-20 minutes for it to thaw before scooping. I prefer an ice cream scoop that has a trigger release so it comes out easier. Running it under warm water also helps. Garnish with a sprig of fresh mint and serve immediately. Disclaimer: Please note that some of the links above are affiliate links. Remove the rind from a cantaloupe and cut into approximately 1" cubes. Puree the cantaloupe and water in a high speed blender until completely smooth. You can use a food processor, but break down the cantaloupe into a puree first before adding the water. Whip the cold coconut milk along with the sugar in a stand mixer until it thickens slightly - similar to sour cream. 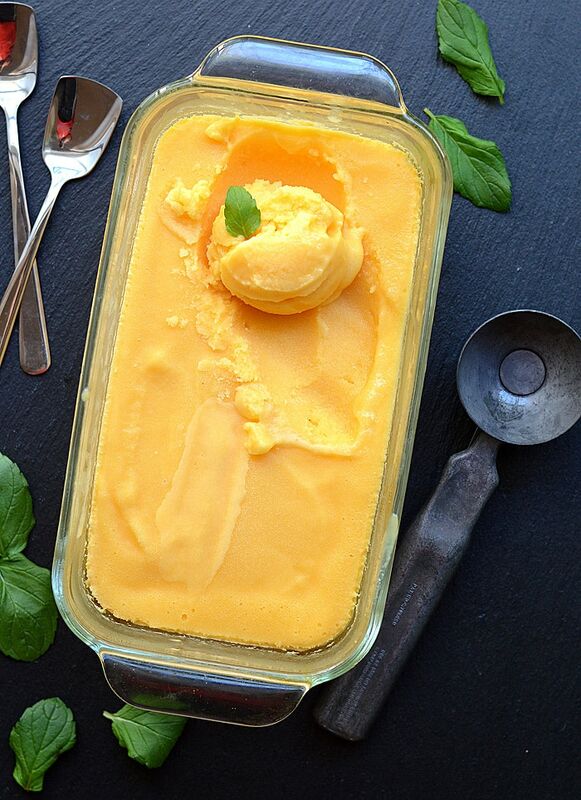 Combine the coconut cream mixture with the cantaloupe puree. Once blended, add to an ice cream maker for about 30 minutes. It will be soft-serve consistency at this point. 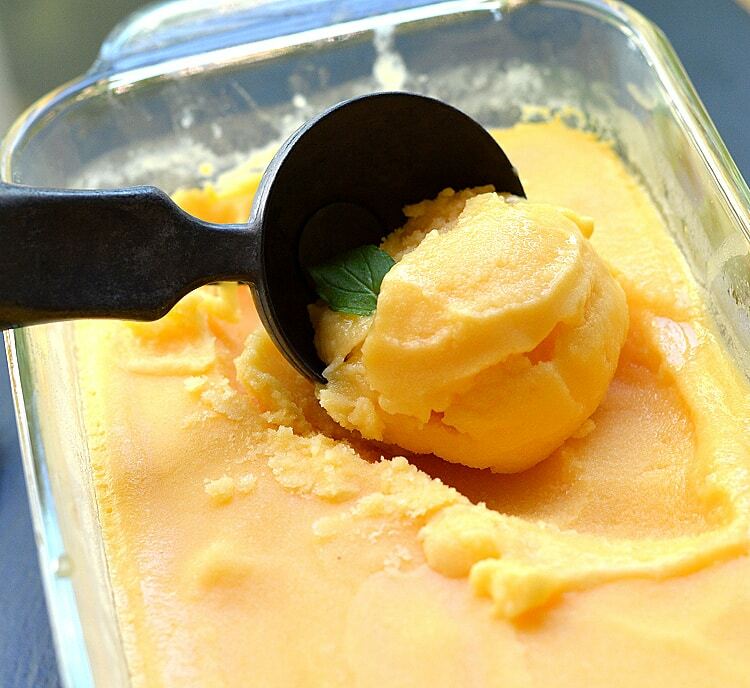 For a firmer, scoopable ice cream, freeze the mixture for a few hours or overnight. Allow to sit for 15-20 minutes before serving. Keep up the Aimasing works Aims. ?